If you feel anxiety each time a project in your facility involves hot work, you are not alone. Hot work has been the cause of numerous fires, combustible dust explosions, and flash fires. In this article, we will explore strategies to manage the hazards of hot work. OSHA defines hot work as any work involving welding, cutting, brazing, or other flame-producing activities. While not mentioned in OSHA’s definition, many companies expand this definition to include grinding of ferrous metals. This spark-producing activity poses an additional ignition source that is often overlooked. Consider including grinding activities in your company’s hot work program. Prior to performing hot work, consider alternatives to eliminate potential ignition sources in the operating facility. Alternatives may include using powered saws instead of a cutting torch or relocating the work to a designated area such as a maintenance shop. As a team, identify ways to eliminate, control, or reduce exposure. Each facility needs to establish a process for coordinating and approving hot work activities. It is common for managers, supervisors, or maintenance personnel to coordinate the process. All opportunities for eliminating, reducing, or controlling the hazards should be discussed prior to issuing the permit. Hot work permits should be specific to each job or project. Complete permits frequently for longer-term projects. Conditions change quickly in our industry. Therefore, we must continually evaluate the work environment. Ensure that sprinkler systems, fire hydrants, fire hose, and detection systems remain in service during the work. 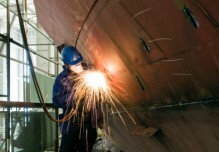 Ensure that welding and cutting equipment is in good repair. This means that all equipment including gas hoses, flashback arresters, fire resistive tarps or curtain, torch heads, regulators, leads, grounds, etc. are in acceptable condition. Ensure that adequate precautions are taken within 35 feet of hot work activities. This may include removing or wetting down areas that have combustible dust that cannot be removed completely, removing flammable and combustible liquids, covering combustible materials with fire-resistive tarps or metal shields, covering all floor openings, and suspending fire resistive tarps below overhead work, where sparks may travel to areas below. Ensure that wall or ceiling construction materials are not combustible. Purge and clean all enclosed equipment of all flammable and combustible liquids and vapors. One precaution that typically is not present on most generic hot work permits is isolating all conveyance, bucket elevators, or other moving equipment, This equipment can transport smoldering materials to other areas of the facility. Picture sparks igniting dust or material on a conveyor or in a bucket elevator. The equipment is started. The smoldering material ignites suspended dust inside the equipment or is conveyed to a storage bin, tank, or silo. The outcome could be catastrophic. Assign a person to fire watch detail during and after hot work activities. The fire watch must have a suitable fire extinguisher, charged hose, or other means to put out smoldering material or incipient fires. He or she will need sufficient training on how to use the equipment and initiate an evacuation of the area, if needed. Fires may start during and several hours after hot work activities are completed. A fire watch should be provided for at least 60 minutes after the work has been completed. Therefore, it is best to plan hot work activities to allow adequate time for fire watch and inspection. Contractors have caused fires in the workplace. It is imperative that they are educated on the company requirements. It is helpful to conduct a pre-project planning session with contractors to discuss opportunities to eliminate, reduce, or control the hazards associated with the work. You also may consider reviewing their hot work program prior to allowing them to perform hot work within the facility. Whether performed by company employees or outside contractors, hot work has the potential to cause fires, explosions, and flash fires. Pre-planning is a critical component of managing hot work activities. Continually evaluate each scenario to identify, eliminate, control, or reduce its hazards. Ensure that employees and contractors know the procedures and requirements at your facility. Respect the exposure that hot work creates. Do not play with fire. Progressive Safety Services provides OSHA required safety training that is relevant, interactive, and easily understood by our employees. Progressive provides the safety training in a manner that encourages participation, resulting in a trained team of employees. Joe Schweitzer – Operations Manager, The Andersons Inc.